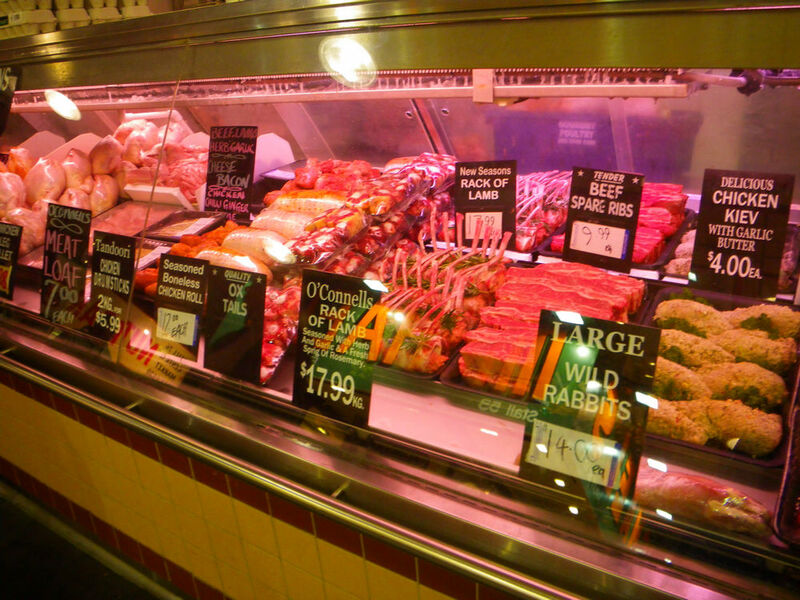 Continue on updating my guide to Adelaide Central Market, this week we will talk about meat. Nowadays, the supermarkets are getting bigger and better, more and more people start to use supermarkets for their primary source to buy meat. However, one problem with supermarkets is that you can’t always get the cut you want or sometime the cut are either too thick or two thin. Also, the type of meat available in supermarkets may not be broad enough to cater for every need. Hence, individual butchers are better in providing customerized cuts and/or better quality meat with broader varieties. 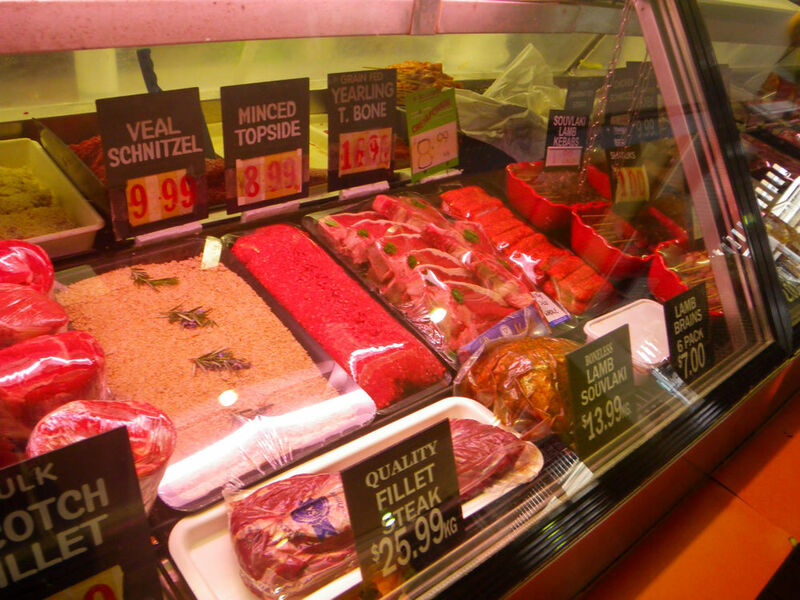 Adelaide has got extensive amounts of butchers, specialising in different areas. 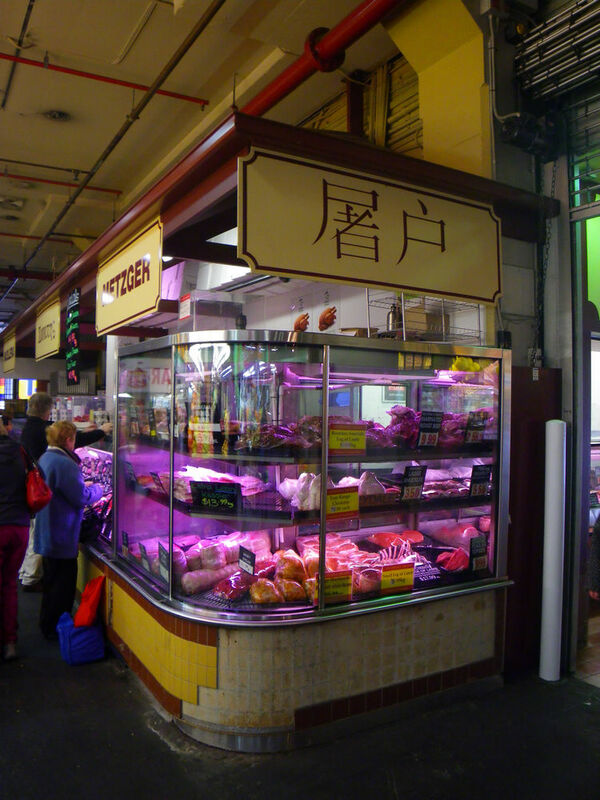 There are a number of butchers in the Central Market and different requirements can be fulfilled. When entering from the main entrance of central market, on the right, the first shop that shoppers came across is O’Connell Meat. 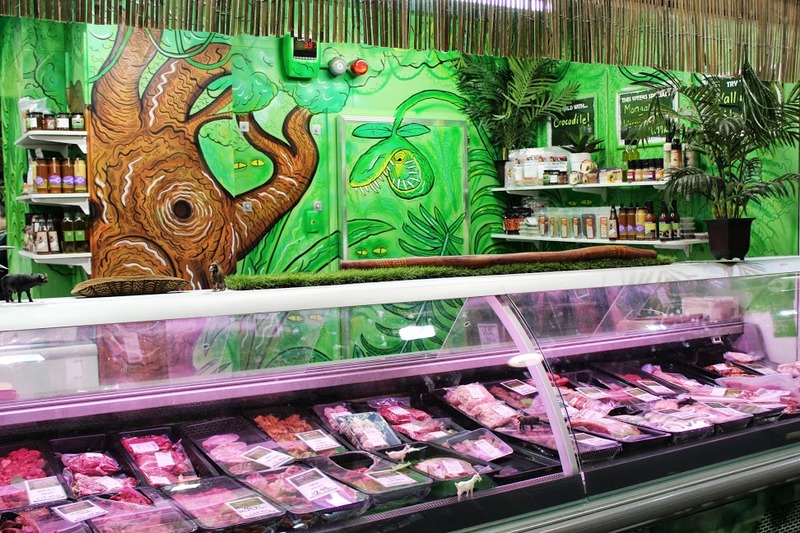 The store has operated for over 40 years and specialises in different meat products. From quality lamb and beef to skewers and specialty products, the shop gained its popularity both in the locals and people from other cultural backgrounds. During my interview, the owner, Tony, also specified that all their meat products were locally sourced. Actually, these quality local meat products came fresh into the store on regular basis. 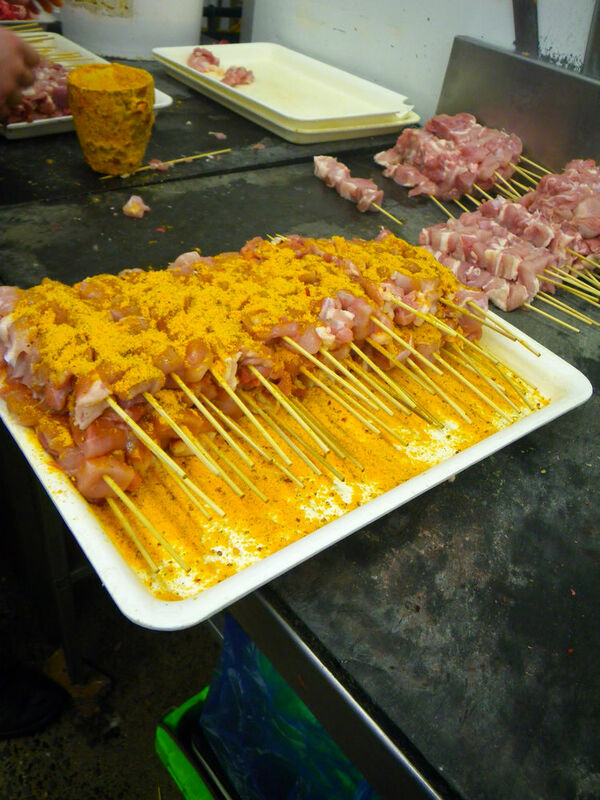 For products such as chicken skewers, the butcher make them onsite rather than ordering in premade products and while we were chatting, a new tray of the skewers was just made. Looks yum! The processing desk and all accessories were clean, tidy and well organised and this is a good indication of the quality of the products. 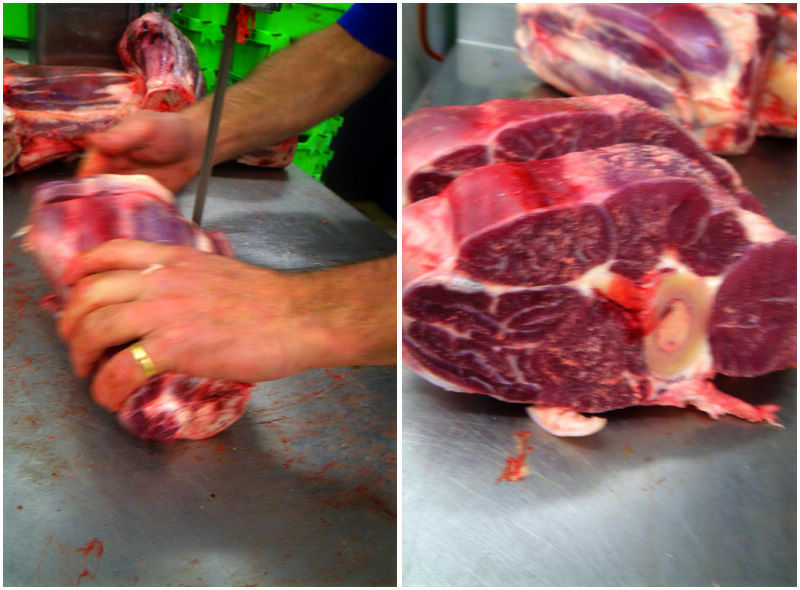 In addition to the regular cuts, O’Connell Meat is also an expert in providing cuts for all nationalities. From their display, people from other cultural backgrounds can easily find what they need. There are cuts for Indian cuisines, for East Asian cuisines and specialty products such as osso bucco and oxtail for all needs. Oh, by the way, the oxtail makes good and delicious soups with tomato and celery. 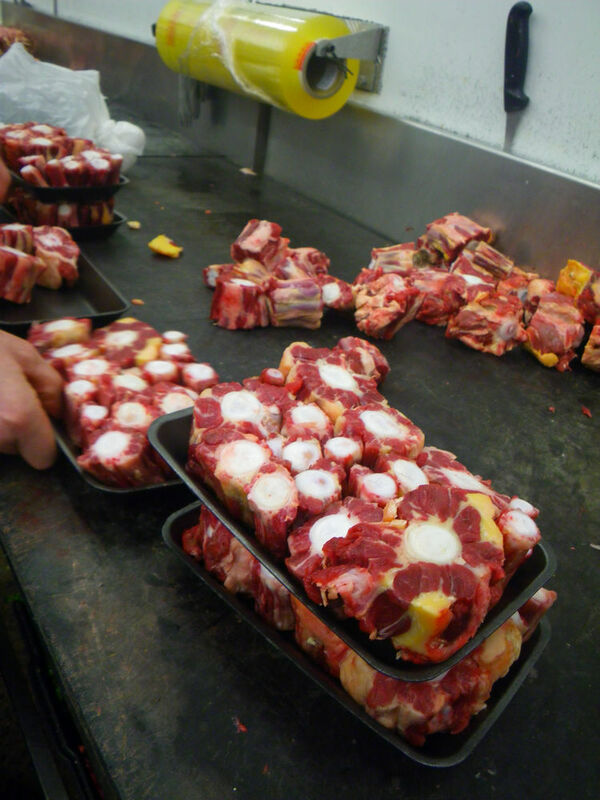 While I was there, Tony was in the process of cutting beef osso bucco which looked so fresh and made me desperately wanting to cook beef stew on the day! Fresh meat, good quality, large variety and affordable prices are my words to summarise O’Connell Meat. Contributed by Joanne from http://whatsonthelist.net/ and modified to fit the content of the guide. First of all, thank you to Richard Gunner, owner of Feast! @The Market and Vince Minervini, Marketing and Online Manager of Feast! Fine Foods for their participation in Adelaidefoodies.com Complete Guide of the Adelaide Central Market. Feast! @The Market is the central market brand of Feast! Fine Foods and has been in the Central Markets since 2004. 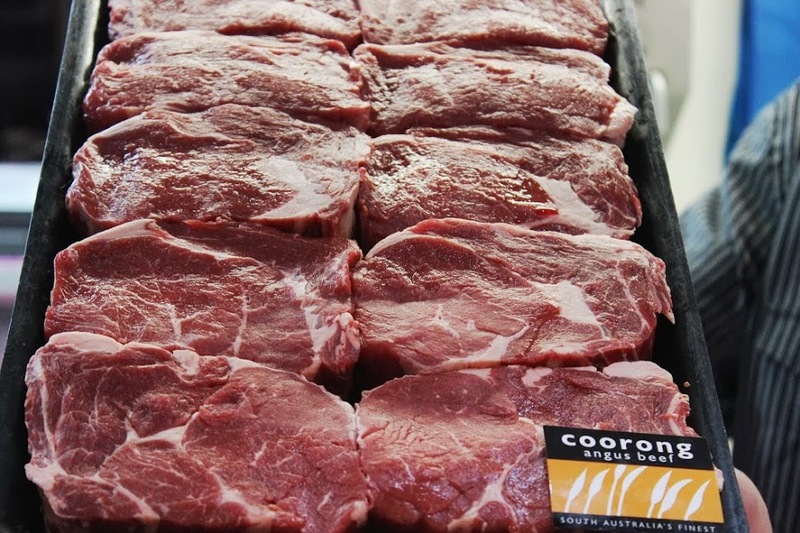 They have their own branded beef and lamb products such as the Coorong Angus Beef and Hay Valley Lamb ; both products are produced in South Australia. Feast! 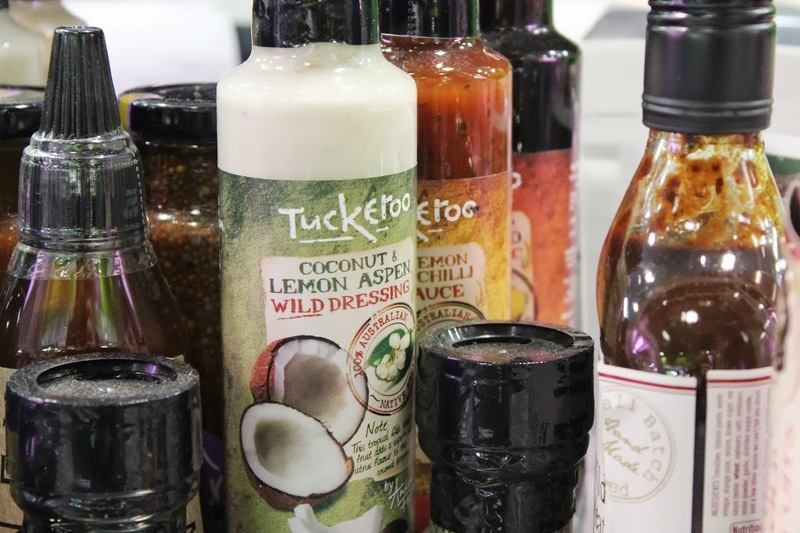 @ The Market also supports other local producers by offering their products in store. Feast! @ The Markets “source some of the finest premium products from around the country for their discerning customer base.” Other premium meat products that Feast! 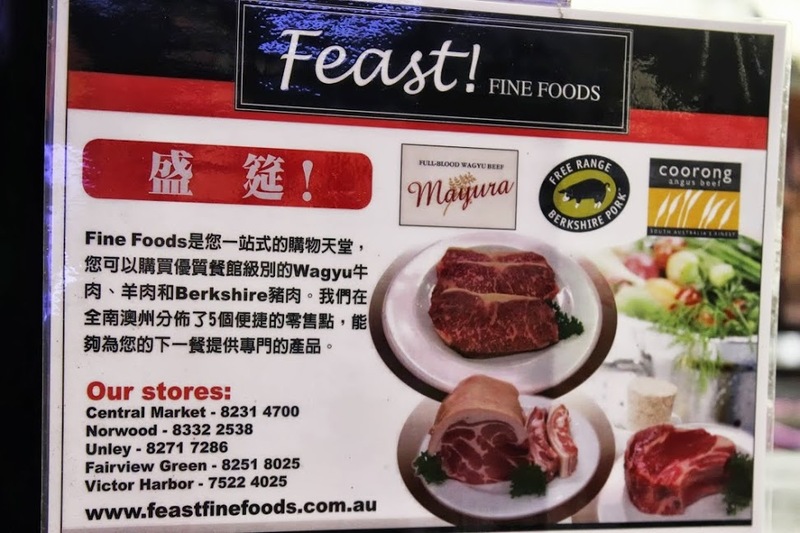 sells include Wagyu beef, Berkshire pork and quality lamb. Today Joanne had the pleasure of talking to Feast! @The Markets butchers who were very professional, warm and friendly. Denise and Sam were more than happy to help with suggestion meat selections, advice on how to cook and highlighted the Scotch Fillet is popular in this stall. Feast! 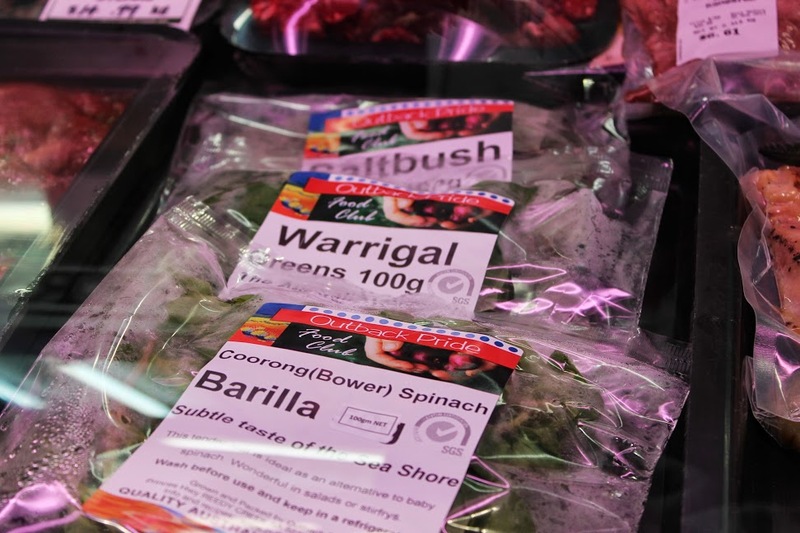 @ The Market has provided their most popular products are their Coorong Angus Beef, Hay Valley Lamb and Saskia Beer Barossa Farm produce range. Courtesy of a giftcard via @Feast! Fine Foods for her participation in their Poultry and Game Butchery Course, Joanne selected 1.5 kilo beautiful piece of boneless Coorang Angus Beef Sirloin and delightedly recreated their recipe as found on their website. Feast! 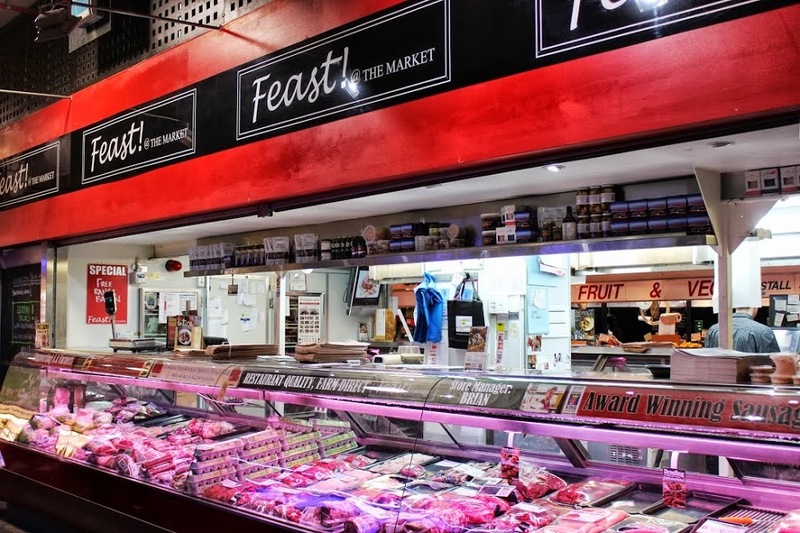 @ The Market runs a “paddock to plate” business so they have “control of their branded products right from the farm through to the butcher stores.” However, more importantly, they always love customer feedback, which allows them to develop their products even further! Feast! 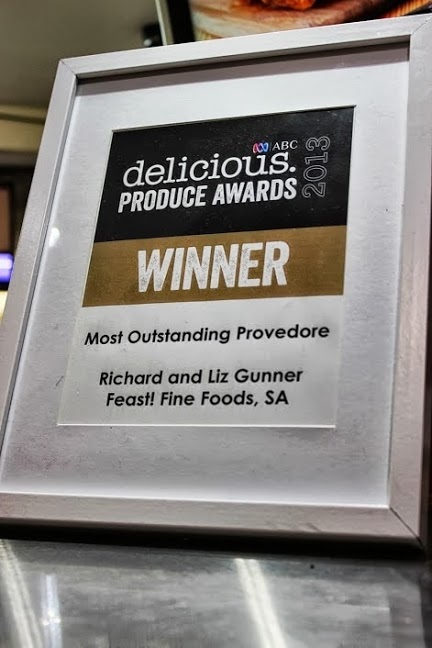 @The Market “has entered and won” numerous awards over the years and they use these competitions for “ways to improve what they offer their customers.” Richard and Liz’s most recent award by delicious.PRODUCE AWARDS is for MOST OUTSTANDING PROVEDORE! Congrats! Feast! is not only Joanne’s primary butcher, but also my butcher for wagyu beef. Check my reviews out here. Contributed by Joanne from http://whatsonthelist.net/ and modified to fit into the guide. 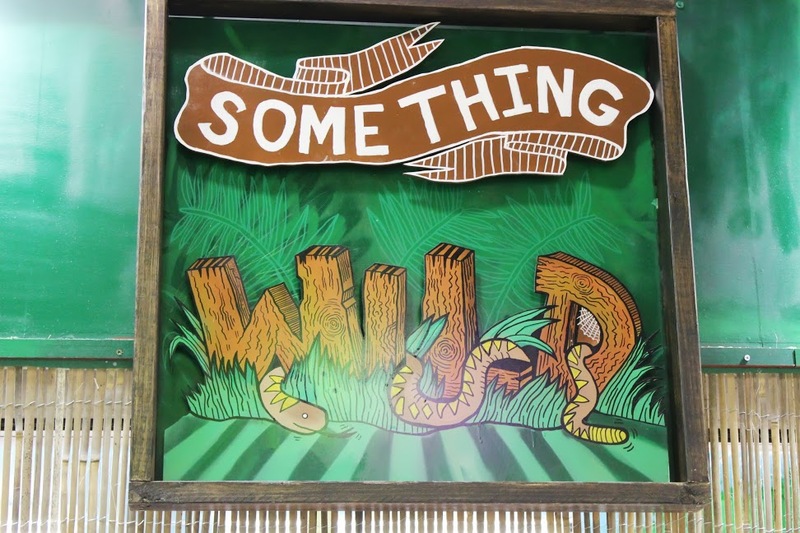 Something Wild has been in the Central Market since 2012. 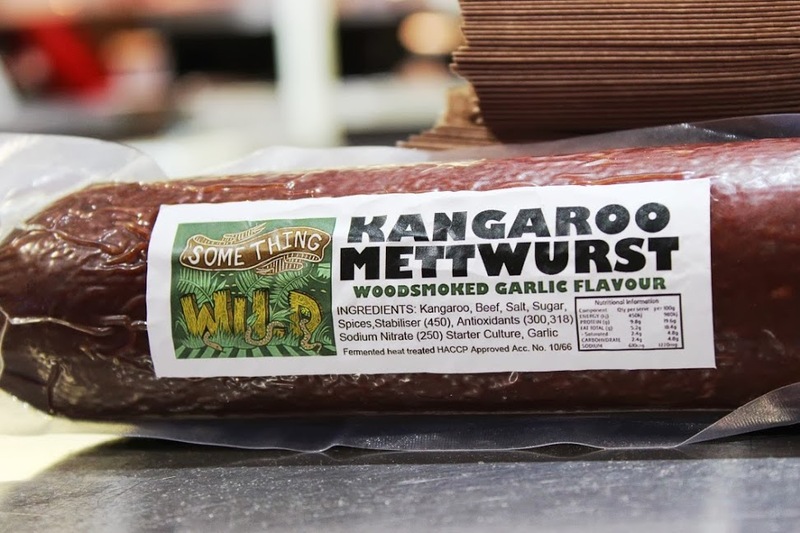 Their main focus is on Kangaroo meat as well as specializing in distributing other meats such as Wild Boar, Goat, Rabbit, Crocodile, Venison, Buffalo. 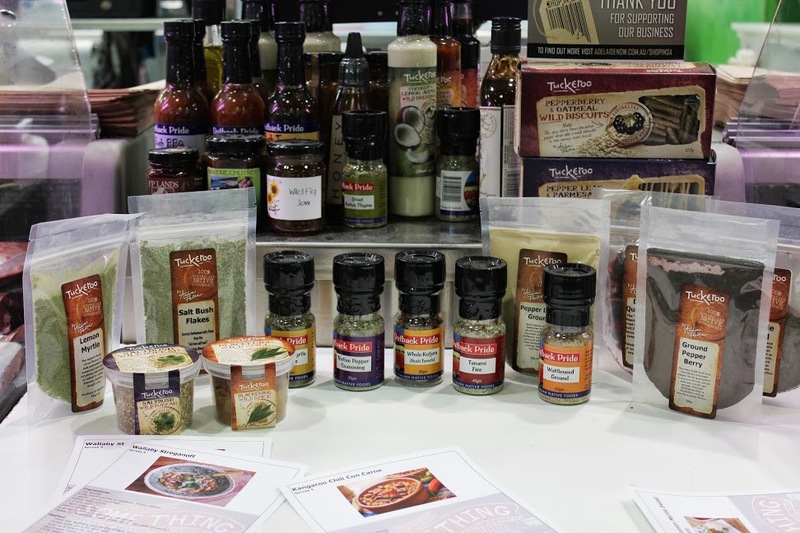 They also includes a wide variety of specialty products including Australian native herbs and spices from Australian producers. What I also enjoyed in my time spent with Damon at Something Wild, is his passion in explaining about the various wild meats, cuts, recipes and what with all of them to “have a go” (Aussie lingo for trying). 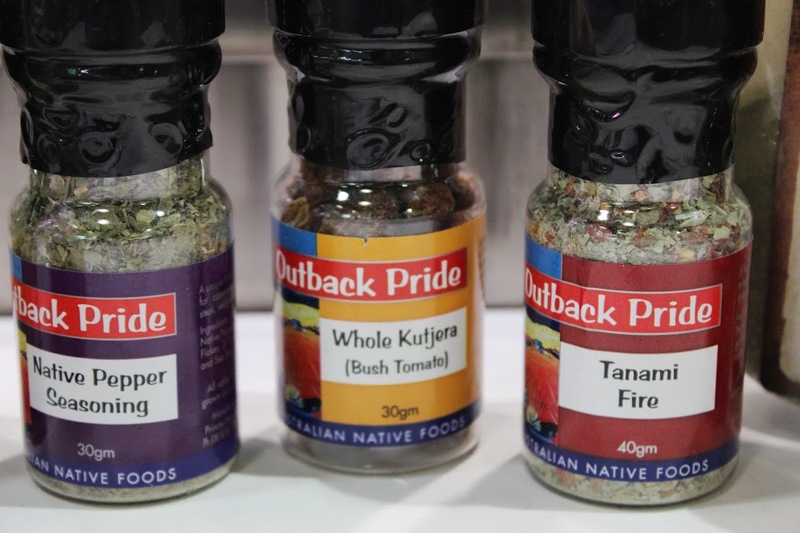 Try something different from our normal meat varieties and seasonings and dig into the world of Australian wildness with spices with names that we don’t normally hear. Courtesy of Something Wild, Joanne was provided with some wallaby, crocodile, salt bush leaves and quail to try and create unique dishes! Did you know for this long holiday weekend in Adelaide, Something Wild’s first “sensational product” is quail kabobs marinated in….? “What is Something Wild’s most popular product?”, I hear you say? Marinated Kangaroo Steak, Kangaroo Loin Fillet and Diced Goat; all which Joanne have previously cooked with before! So, what’s stopping you Adelaidians from experiencing Something Wild today? 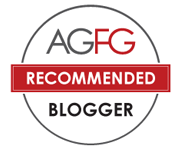 If you need or want any recipes, Please contact Adelaidefoodies and Joanne as well as Something Wild to be provided a recipe to start you on your Something Wild way! G’day Xin! Through our visits of the Adelaide Central Markets, enjoyed learning the stories behind the very PASSION producers and hearing about the meats that are locally sourced, locally produced and what makes their stalls unqiue too! but is it organic or gmo produced? Hi Darinka, thanks for visiting. No GMO products are allowed in Australia. Great post! I agree we need to have a guide for people to read if they are new to Adelaide. I am a regular at the market but never noticed something wild before because I don’t really eat the wild meat! Wasn’t it WildOz or something like that? Anyway, good post and looking forward to reading more! They changed to Something Wild last year. I agree new comers need to know our market fairly well as that’s where we all shop for quality food at affordable prices! I want goat meat and would never have found Something Wild without you.. Your reader from Melbourne here. I am visiting Adelaide next week and looks like I have to spend a full day here. Are there free tastings etc in this market too?Thanks for the guide! Oh, I just returned from Melbourne last week! I like your Queen street market too. Be sure to visit Adelaide Central Market though as you will find heaps of goodies. As to free tasting, some stores have them at different occasions, or you can just ask. There are some good small eateries in the market too. If you are starving at any point, sit down and enjoy some quality meals! Great post. I use all 3 of those butchers for various items, especially Something Wild for my game meat. I love having them all available in one convenient location. The Central Markets is my Foodie Heaven!! Great stuff. Love a good market… Making me want to visit Adelaide!! O’Connell is our primary option for butchers in Adelaide. The good price and top quality of meat is unbeatable. Like your guide. Great post, thoroughly useful and informative. I’m afraid I’m guilty of supermarket meat shopping…but, I’m really enjoying having Springfield butchers in the new Walkerville centre. You’re right, it’s a far superior product and youyou can’t beat having the expert advice on offer.